This blog refers to Ramanagara District (earlier a part of Bangalore Rural District). Ramanagara City is the District Head Quarters of Ramanagara District. Ramanagara is just 50 kms away from Bangalore, the capital of Karnataka state in India. Latest developments can be had from this blog. When Common Wealth Games Queens Baton arrived today (2nd September 2010) at 12.55 noon from Mysore at Ramanagaram District Office, Ramanagaram, the elected representatives, govt. officials, press persons, student community and general public were elated. 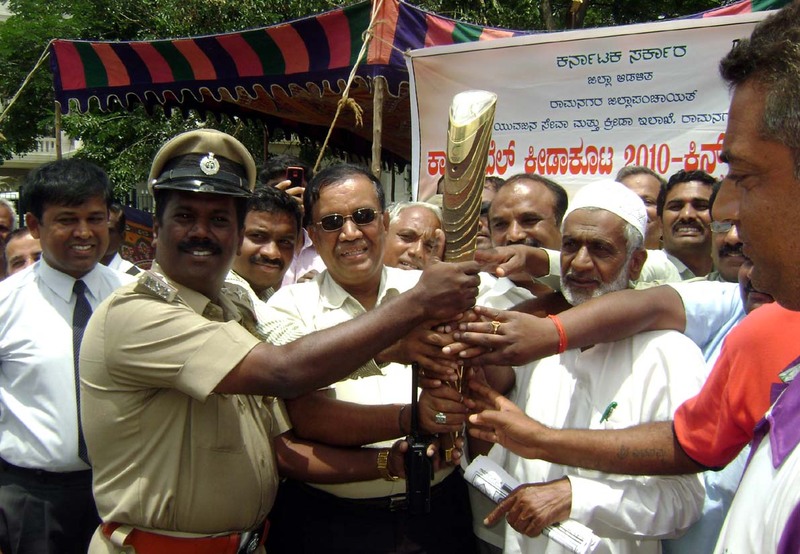 They heartily welcomed the baton, wished the common wealth games all success and let the baton to continue its journey to Bangalore the capitol city of Karnataka. MLA K.Raju, Z.P.President Nagaraj, CMC president Saban Saab, Deputy Commissioner G.L.Chandra Shekaraiah, Asst.Commissioner Vijay Kumar, Tahsildhar D.B.Natesh, Circle Inspector Krishna Murthy on behalf of the district citizens wished all success for the games. Before the baton was sent off the accompanying officials were served with tender coconuts.